The Leap chair has quickly become one of Steelcase's flagship products. With an exceptional range of adjustments, Leap delivers full support for all body shapes and sizes. Leap's LiveBack technology flexes to change shape as your back changes shape, providing stable support and encouraging unrestricted movement. 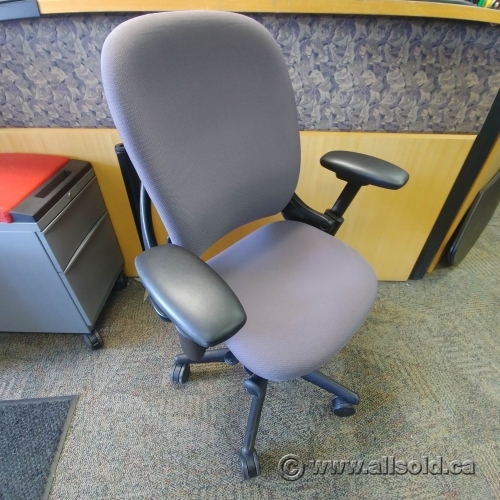 Its separate controls for lower back firmness and upper back force easily adjust for all day comfort. Leap has undergone a complete Life Cycle Assessment, evaluating the chair’s lifelong impact on the environment — from materials extraction through production, shipping, use, and end of life. Leap has received Silver Cradle to Cradle Product Certification from MBDC and also has Indoor Advantage certification from Scientific Certification Systems as being a low emitting product. An easily movable lumbar support bar can be positioned to fit comfortably into the curve of your lower back for additional back support. The firmness tension knob allows you to set the amount of firmness you need to help maintain your lower spine's natural curve. The seat depth adjusts to fit your legs and body shape for long-term comfort. Your chair will easily adjust to ﬁt various heights. Upper back force controls the amount of "push back" as you recline. Variable back stop sets the angle of recline to one of five positions. Eliminate kinks in wrists, elbows, and neck. Arms adjust in four directions (height, width, depth, pivot) so you can find a natural and supportive position. Weight tested up to 300 pounds with no loss of performance.